The American Nuclear Society (ANS) has awarded Massachusetts Institute of Technology (MIT) Professor Richard Lester with the 2015 Special Award, the institute announced on Tuesday. He received the award for his work in research and analysis in the area of nuclear energy and expressing the value of nuclear power to a wide audience. Lester serves as a Japan Steel Industry Professor of Nuclear Science and Engineering. 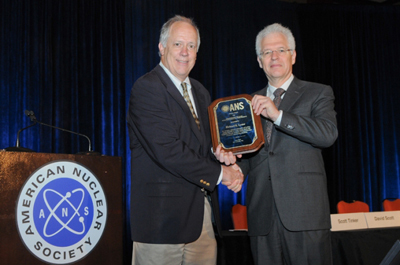 The ANS Special Award recognizes significant effort in research and advancement of nuclear energy within a specific spectrum, which is determined by the society's board of directors on an annual basis. The award was established in 1962 in order to provide recognition to individuals that have in some way improved and helped nuclear science and the nuclear energy industry forward. Lester's research focuses on innovations of energy and manufacturing systems at local, national and regional levels. He has been a leading researcher in several studies of innovative performance and competitiveness on behalf of governments and global industrial groups from around the world. Other research interests include nuclear technology management and control. Lester currently serves as head of the MIT Department of Nuclear Science and Engineering and acts as the director of the Industrial Performance Center. Want to get notified whenever we write about American Nuclear Society ? Next time we write about American Nuclear Society, we'll email you a link to the story. You may edit your settings or unsubscribe at any time.